I wouldn't say it's so much about being lazy as it being a relatively simple/quick/cheap way for various different devs/publishers to get some new gen revenue coming in. Generally with games that were multiformat I've often got the PC version now anyway and so have, in effect, all but played the 'enhanced' version (1080p/60 fps if nothing else) and don't feel the need to pick up the more expensive PS4/XO equivalent. With the Last of US I was more than happy to pay for (minus the £20 I got for my PS3 copy) play a game I thought was great all over again with improved visuals and some extra bells and whistles. I'm not really a Saints Row fan (still haven't played III) but I think if I was and didn't have a games-worthy PC I would welcome this release. I guess the reason more games are being given the 'remastered' treatment is because they are proving profitable (as so many 'HD Editions' did last gen), which suggests that enough people do want them to make it worthwhile. I know you know this already Rich but for me these fall squarely in the 'if you don't want 'em, don't buy 'em' bracket. Scrustle wrote: Maybe they should have done more to differentiate this "New" 3DS, at least with the name. Like what the Game Boy Color is to the original Game Boy. Perhaps people wouldn't have felt like it was fragmenting the userbase so much in that case. To make it feel more like an update with backward compatibility than simply a slightly tweaked version that feels like a middle finger to existing owners. I have to say though, this new 3DS does actually look a lot more appealing to me than the old one. It actually has a second stick! I'm not sure on the usability of the thing though. I don't get how that little nub is supposed to work, or quite how you're supposed to be able to reach those new shoulder buttons either. Yep I know what you mean but I dont remember the first 12 months of a next gen peppered with upscales like this. I might be wrong as I took a time out around Ps3/360 time. DomsBeard wrote: Yep I know what you mean but I dont remember the first 12 months of a next gen peppered with upscales like this. I might be wrong as I took a time out around Ps3/360 time. You're right, it wasn't really like this last gen, but then I think due to the architectural differences (and the changes in the market) it wasn't as appealing or viable an option back in 2005/6/7 as it is now. That said there were a fair number of hastily upgraded Xbox to 360 ports. And on the plus side, at least the first new gen versions of things like FIFA weren't a total disgrace this time round! Another remake? And people are finally getting bored of them? As someone who has enjoyed the last two saints games. I feel Saints IV needs to be left where it is, the games have been using the same mechanical and visual engine for far too long. I really felt IV was stretching it thin when you compared to other sandbox games released. I can understand GTA V getting a remake as it was arguably pushing the consoles beyond their capabilities. However saints IV wasn't, it looked dated. You can't polish a turd? It makes sense for a game that could use an extra boost in power to be ported over, like GTA5, or if a game is cross-generational and being released on both platforms at the same time, but SR4 is neither of those. I don't have much of a problem with porting stuff to the new machines if it could benefit from it, but this is taking it too far. It's unnecessary. Plus, haven't they already released a "complete edition" type thing anyway? People I know who played both the PC version and the console versions of SR4 told me that the PC version was a substantially superior experience, so I can see the appeal of a console version that looks and runs as well as the PC version did when maxed out. 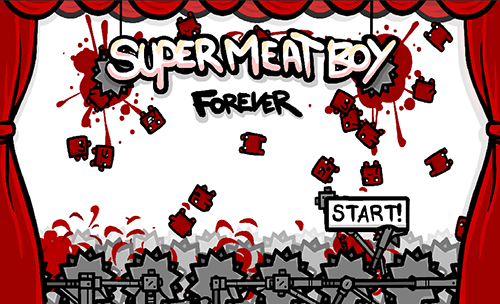 Super Meat Boy Forever announced, shown at PAX! I for one wouldn't mind playing Saint Row IV again with a more stable framerate and a better spec supporting the powers and effects. I can see the publisher wanting to get more money back on this one particularly after both a) forking out to buy the IP and b) funding the final phases of development. This was a remarkably fun game and to be honest if you don't want to buy it again or didn't buy it first time you don't have to again - nothing is being taken too far. This isn't like a first party charging for backwards compatibility by reselling a game. It is a game that had a troubled development with a publisher who was on its way out and to be honest I imagine it is this kind of act that stops Deep Silver from switching off the lights at Volition. Great news about Meat Boy! ...did I forget to say that I am REALLY happy. A new 3D Ys game will be released next year in Japan. It's an open-world action-RPG on the PS4 and the PS Vita. I've never touched the Ys series, I'd love to know if it is good or not. I'm already happy with TGS, this pre stuff is so up my alley. We definitely have at least one Ys fanatic on the forum here. I've not played an Ys game myself either but I know it's one of those series where the folks who are into it are really into it. I really really REALLY dislike Akira Toriyama's art style. Yes, I understand that's heresy. But I do. It might be viewed as 'heresy' on other forums but here it's just matter of personal taste. I like the games his art is used in but don't much like his particular brand of manga art, the hair and eyes in particular. So don't worry about it, I don't think it's an uncommon opinion. Same as Arry really, I certainly don't love his particular style but I am a fan of Chrono Trigger. Chrono Trigger is interesting, in that the character concept art style doesn't really bleed into the game much and so I don't really notice it. But I found I couldn't stick with Blue Dragon for very long because of the art.